It’s what you would expect, a little larger than most BrewDog bars and pretty busy on its second day of opening. My first drink was a pint of Jet Black Heart, it was decent but inevitably on the cold side and priced at £5.35. After this I decided to nip up to The Nags Head as one should always do when in town. 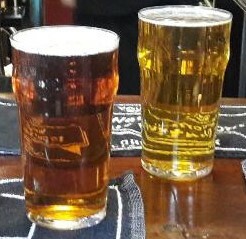 A pint of 3.0% Riding Ale from Howling Hops at £3.40 was followed by a half of Dark Star Cocoa Nut, 6.0% on key keg, £2.70. At this point I decided to catch the bus back to my local. But on my way back I got to thinking, factoring in my £8.00 return bus ticket , the cost of my brief trip cost me the grand total of £23.35 for less than three pints. I enjoyed the beer and the venues, but it begs the question, am I mad? I make you right on both counts.